As the bass player in Tom Petty's Heartbreakers, Ron Blair went from the nightclubs of Gainesville to the coliseums of the world in just a few years. He was one-fifth of a wildly successful rock 'n' roll band, and just at the apex of his hard-earned career -- at the time most people would've been content to lean back and count their money -- he threw it away and started over. In the early '70s, Ron Blair had left Gainesville for Southern California, where the women were beautiful, the beach was nearby, and the music business, in which he hoped to make a buck or two, was a way of life. He was 23. Four fellow Hogtown expatriates convinced Blair to join their band. The band didn't have a name, but it did have a record deal, due to the singing and songwriting talents of its frontman. Blair knew Tom Petty well, respected his talents, and joined his group without reservation. Within five years, the band -- dubbed at the very last minute Tom Petty and the Heartbreakers -- was the biggest act on the road, selling out arenas from coast to coast and tearing it up in Europe and the Far East. Critics called them the American Rolling Stones. In 1980 alone, the Heartbreakers sold over three million albums; Blair, like his bandmates, amassed a sizable bankroll. And then, abruptly, he quit. "Some days I'll think, 'Couldn't I have put up with it?'" the 41-year-old Blair says in a telephone interview from Los Angeles, where he still lives. "At the time, it was really a gut decision. That's kind of what I regret, that it wasn't a real thought-out decision. "I physically and verbally tuned out on an emotional level, rather than really thinking it out." Purely and simply, he says, it just ceased to be fun. That's why he broke with the band. Today, Blair owns and operates a swimwear shop called Shapes, on a busy downtown street in Tarzana, a Los Angeles suburb. He bought the business in 1982, just after he told Petty he "couldn't get back on the bus" and on on another tour. "The first couple of years we were open, there was a rumor that Tom Petty's wife had opened the shop," Blair says with a chuckle. "We didn't do anything to squelch it." Ron Blair's father, a career Navy man, moved his family around the world and eventually put down roots in Macon, Ga., where Ron was born. 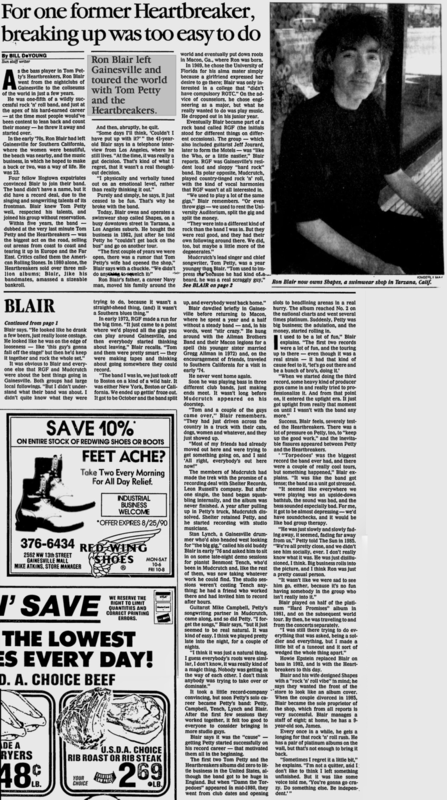 In 1969, he chose the University of Florida for his alma mater simply because a girlfriend expressed her desire to go there; Blair was only interested in a college that "didn't have compulsory ROTC." On the advice of counselors, he chose engineering as a major, but what he really wanted to do was play music. He dropped out in his junior year. Eventually Blair became part of a rock band called RGF (the initials stood for different things on different occasions). The group -- which also included guitarist Jeff Jourard, later to form the Motels -- was "like the Who, or a little nastier," Blair reports. RGF was Gainesville's resident loud and sloppy "hard rock" band. Its polar opposite, Mudcrutch, played country-tinged rock 'n' roll, with the kind of vocal harmonies that RGF wasn't at all interested in. "We used to play a lot of the same gigs," Blair remembers. "Or even throw gigs -- we used to rent the University Auditorium, split the gig and split the money. "They were into a different kind of rock than the band I was in. But they were real good, and they had their own following around there. We did, too, but maybe a little more of the degenerates." Mudcrutch's lead singer and chief songwriter, Tom Petty, was a year younger than Blair. "Tom used to impress me because he had kind of a beard, he was a real scraggly guy," Blair says. "He looked like he drank a few beers, just really loose onstage. He looked like he was on the edge of looseness -- like 'this guy's gonna fall off the stage!' but then he'd keep it together and rock the whole set." It was obvious to Blair and everyone else that RGF and Mudcrutch were about the best things going in Gainesville. Both groups had large local followings. "But I didn't understand what their band was about. I didn't quite know what they were trying to do, because it wasn't a straight-ahead thing, (and) it wasn't a Southern Blues thing." In early 1972, RGF made a run for the big time. "It just came to a point where we'd played all the gigs you can play around Gainesville, and then everybody started thinking about leaving," Blair recalls. "Tom and them were pretty smart -- they were making tapes and thinking about going somewhere they could record. "The band I was in, we just took off to Boston on a kind of a wild hair. It was either New York, Boston, or California. We ended up gettin' froze out. It got to be October and the band split up and everybody went back home." Blair dawdled briefly in Gainesville before returning to Macon, where he spent a year and a half without a steady band -- and, in his words, went "stir crazy." He hung around with the Allman Brothers Band and their Macon legions for a spell (his younger sister married Gregg Allman in 1972) and, on the encouragement of friends, traveled to Southern California for a visit in early '74. Soon he was playing bass in three different club bands, just making ends meet. It wasn't long before Mudcrutch appeared on his doorstep. "Tom and a couple of the guys came over," Blair remembers. "They had just driven across the country in a truck with their cats, dogs, women and whatever, and they just showed up. "Most of my friends had already moved out here and were trying to get something going on, and I said 'All right, everybody's out here now!'" The members of Mudcrutch had made the trek with the promise of a recording deal with Shelter Records, Leon Russell's company. But after one single, the band began squabbling internally, and the album was never finished. A year after pulling up in Petty's truck, Mudcrutch dissolved. Shelter retained Petty, and he started recording with studio musicians. Stan Lynch, a Gainesville drummer who'd also headed west looking for "the big gig," called his old buddy Blair in early '76 and asked him to sit in on some late-night demo sessions for pianist Benmont Tench, who'd been in Mudcrutch, and, like the rest of them, was now taking whatever work he could find. The studio sessions weren't costing Tench anything; he had a friend who worked there and had invited him to record after hours. Guitarist Mike Campbell, Petty's songwriting partner in Mudcrutch, came along, and so did Petty. "I forget the songs," Blair says, "but it just seemed to be real natural. It was kind of easy. I think we played pretty late into the night, for a couple of nights. "I think it was just a natural thing. I guess everybody's roots were similar, I don't know, it was really kind of a magic thing. Nobody was getting in the way of each other. I don't think anybody was trying to take over or dominate." It took a little record-company convincing, but soon Petty's solo career became Petty's band: Petty, Campbell, Tench, Lynch and Blair. After the first few sessions they worked together, it felt too good to everyone to consider bringing in more studio guys. Blair says it was the "cause" -- getting Petty started successfully on his record career -- that motivated them all in the beginning. The first two Tom Petty and the Heartbreakers albums did zero to little business in the United States, although the band got to be huge in England. But when "Damn the Torpedoes" appeared in mid-1980, they went from club dates and opening slots to headlining arenas in a real hurry. The album reached No. 2 on the national charts and went several times platinum. Suddenly, Petty was big business; the adulation, and the money, started rolling in. "When we started doing the third record, some heavy kind of producer guys came in and really tried to professionalize it. And from that point on, it entered the uptight era. It just got uptight from really that moment on until I wasn't with the band any more." Success, Blair feels, really tested the Heartbreakers. There was a lot of pressure on Petty, too, to "keep up the good work," and the inevitable fissures appeared between Petty and the Heartbreakers. "'Torpedoes' was the biggest record the band ever had, and there were a couple of really cool tours, but something happened," Blair explains. "It was like the band got tense; the band as a unit got stressed. "It seemed like everywhere we were playing was an upside-down bathtub, the sound was bad, and the bass sounded especially bad. For me, it got to be almost depressing -- we'd have soundchecks, and it would be like bad group therapy." "He was just slowly and slowly fading away, it seemed, fading far away from us," Petty told the sun in 1985. "We're all pretty close, and we didn't see him socially, ever. I don't really know what it was. He was just disillusioned, I think. Big business rolls into the picture, and I think Ron was just a pretty casual person. "It wasn't like we were sad to see him go, either, because it's no fun having somebody in the group who isn't really into it." Blair played on half of the platinum "Hard Promises" album in 1981, and on the subsequent world tour. By then, he was traveling two and from the concerts separately. "I was still there trying to do everything that was asked, being a soldier and everything, but I made a little bit of a tuneout and it sort of wedged the whole thing apart." Howie Epstein replaced Blair on bass in 1982, and is with the Heartbreakers to this day. Blair and his wife designed Shapes with a "rock 'n' roll vibe" in mind; he says they wanted the front of the store to look like an album cover. When the couple divorced in 1985, Blair became the sole proprietor of the shop, which from all reports is very successful. Blair manages a staff of eight; at home, he has a 9-year-old son, James. Every once in a while, he gets a longing for that rock 'n' roll rush. He has a pair of platinum albums on the wall, but that's not enough to bring it back. "Sometimes I regret it a little bit," he explains. "I'm not a quitter, and I don't like to think I left something unfinished. But it was like some voice told me, 'You're gonna go crazy. Do something else. Be independent.'"